A woman needs 2 types of lipstick, a natural one and one that gets attention! I call it 1 MLBB shade (my lips but better) and one Bright Red shade that works like a charm whenever you use it! When I say works like a Charm, I'm not pertaining to getting a date at once, a quick reminder that makeup is really for oneself! We don't wear makeup for other people okay? Sleek MakeUP recently came up with another line called Lip Shot, their famous Gloss Me and Matte Me won the hearts of many but after trying Lip Shot, hands down, this is my favorite! Sleek MakeUP Lip shot is a highly pigmented intense color impact gloss. Non-sticky formula, developed to compliment all skin tones. Plot Twist - a neutral pink tone light brown shade. Plot Twist is my favorite daytime shade! It looks really nice and healthy on my lips and I love how it brightens my face with just a couple of swipe. 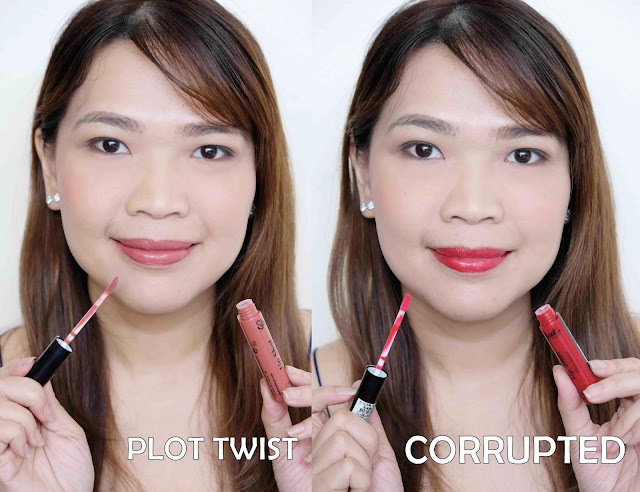 Corrupted is a medium orange red shade. Though I'm not a fan or orange red, this actually works in a way that the lipstick has more red than orange tone. It brightens up the face even for someone with extremely warm complexion. This is my favorite texture as it is lightweight and non-sticky. Pigmentation is super good for a product that is also called a gloss. This is more of a liquid lipstick for me with high moisture. Transfers on cups or mugs but the pigment stays. Lasts approximately 4 hours with eating and drinking. The shine disappears after just 1 eating and drinking but the pigment stays. Not tested on animals which is super good! The packaging is great. You see the color right away. Overall, I love these 2 combo and I would like to check out more shades from them!